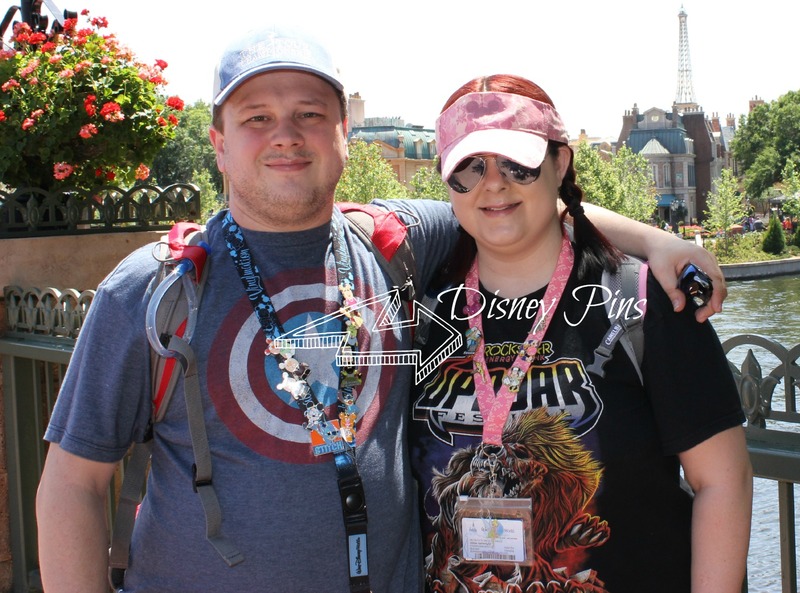 Disney Pin Trading – Perhaps you’ve heard of it. Perhaps you’ve seen people with pins on their lanyards. Perhaps you’ve seen people talking with cast members frequently and wondering what they’re doing. And maybe, just maybe, you’ve seen the pin trading huts and wondered what they were all about. If any of those statements apply to you or you’re really wanting to start pin trading but don’t know what the heck it is, this post is for you. Read on for more…..
Pins are collectible items. They sell the pins in the stores and pin trading booths. Visitors take those purchased pins and trade them with cast members. You are allowed to trade up to two pins per cast member per day. The cast member must trade with you as long as you are not asking to trade for a pin they already have. pin trading is disney’s way to encourage visitor interaction with cast members. I love pin trading. My husband loves it even more. Why? It’s like a game. There are two types of Pins….let me explain. Cast member series pins: these are pins only available to cast members. They are marked with a hidden Mickey on them. The cast member pins are the pins that we are usually after. These are the pins that you are trying to complete a set of. In addition to just being cool, these have the added factor of not being purchasable, so it makes the hunt a little more fun. We have some great memories made from trading with fellow Disney visitors, cast members, etc…. and it’s a great way to break the ice with anyone at Disney. Pin Trading is fun because it’s like a game. The goal is collecting the set(s) of pins that you want. There are rules for pin trading. See above or the offical disney website for pin trading rules. You must put a little investment into pin trading up front because you have to buy pins to trade. Pin trading gives you an added benefit of socialization with cast members and the added memories gathered from pin trading. Buying pins is expensive, especially when I’m going to just trade them. Can I avoid this? There are two things I recommend here. The first is buying a starter kit at the Disney gift stores. Those pin sets come with a lanyard, which you’ll need anyway. Typically, the starter set pins are much cheaper. The second thing I recommend is buying used pins online via the web before you go. I have collected some pins that I want to keep but they fall off my lanyard often. What can I do about this? Disney sells locking pin backs in their gift shop. I recommend using these for pins you want to keep. I also use these for ‘keeper’ pins I buy from the pin stores. What is a ‘chaser’ pin? This is the final completer pin in the set and is often very hard to find. You’ll find people searching for the chaser when collecting. Isn’t this just for kids? Absolutely not! Plenty……let me repeat……….PLENTY of adults pin trade. This really is very similar to a game. Anyone who likes to collect also seems to get involved as well. Some cast members don’t have lanyards – do they not have pins? No, usually, these members have pins on their waistband. You can ask a cast member to see their pins and they will show you. Are their rules for trading with other visitors? There are no official rules for trading with other visitors. That trade is between the two visitors.